The mothership carrying SG-1 and Jacob has been badly damaged. Their attempt to create a supernova succeeded in destroying Apophis's fleet, however his mothership has survived, Teal'c may be captured or dead aboard it, and the blast wave has left both ships stranded in space four million light years from home. As Apophis prepares to destroy his enemy, an unidentified alien ship approaches and engages Apophis in battle, allowing SG-1 the chance to seek cover. After affecting repairs to their shields, SG-1 reemerges to discover that only Apophis's ship remains, and there are no life signs aboard. SG-1 transports aboard Apophis's deserted ship, only to discover that the mothership is teeming with Replicators, and the self-destruct sequence has been activated. They are barely able to seize the hyperdrive crystals and escape before the ship's destruction. When a cargo ship appears, a message is received from Teal'c, who reports that he was revived in the sarcophagus, and has escaped. The cargo ship is brought aboard, but Teal'c is not alone. 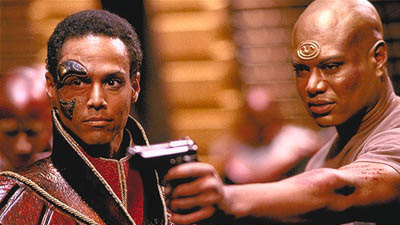 Apophis and his Jaffa are aboard, and Teal'c's exposure in the sarcophagus has returned him to the belief that he is once again Apophis's loyal First Prime. SG-1 become prisoners of Apophis as he plots a course to his new homeworld of Delmak. However, he has unwittingly brought Replicators aboard, and before long the mothership has become infested, and the Replicators have taken control. Now capable of traveling 800 times maximum speed, the ship is rapidly approaching our galaxy. SG-1's only hope is to destroy the sub-light engines, forcing an uncontrolled reentry, and to make their escape in the cargo ship. As the mothership crashes into Delmak, Apophis and the Replicators are presumed destroyed, and SG-1 returns home with Teal'c, now a prisoner, and still loyal to Apophis. The blast wave of the supernova sent both ships to an uncharted region of the universe, in a solar system centered around a blue giant. The shields of SG-1's ship were damaged and the hyperdrive control crystals were destroyed, with no backups available on board. A single one-man pod was launched from Apophis's mothership several minutes prior to the supernova, and was tracked into Goa'uld occupied territory. The Tok'ra are officially considering Selmak a fallen war hero. Once Replicators reach a critical number, they look for new sources of technology to consume. They are capable of doing almost anything to achieve their goals, and were able to modify the ship's engines to travel as much as 800 times its previous maximum hyperdrive speed. By destroying the control crystals for the sublight engines, SG-1 prevented deceleration after exiting hyperdrive, resulting in an uncontrolled re-entry, crashing the ship into Delmak, Sokar's former home world and Apophis' new base. Apophis and the Replicators are presumed destroyed. SG-1's actions will throw the Goa'uld into chaos. The resultant void in dominant power will have the remaining System Lords fighting each other for years to come.